It’s not over until the construction contract is signed. 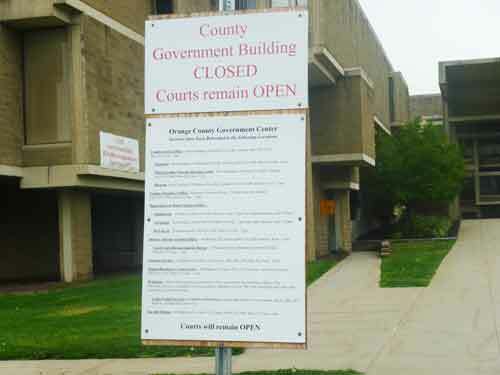 Although the county legislature voted last week in favor of renovating, rather than knocking down, the flood-damaged Orange County Government Center, politicians on both sides of the controversy (the pro-renovation Democrats and the pro-demolition Republicans) now indicate that the rescue of architect Paul Rudolph‘s Goshen, NY, masterwork is not a done deal. Two people runnning for county executive this year contend that last week’s bond authorization was hardly definitive, leaving the door open to reconsideration of [current County Executive Ed] Diana‘s most recent proposal—replacing two-thirds of the complex and keeping the court section intact—or some version of it. “I still think that a final decision hasn’t been made yet,” said Chester Supervisor Steve Neuhaus [a Republican]…. Neuhaus predicted that further study will show that renovations would cost more than new construction…and that “it’ll end up being a mixture of both” approaches. County Legislator Roxanne Donnery, a Democrat…, also doubts the finality of last week’s vote….She questions the sincerity of Republicans who formerly supported new construction but sided with Democrats in support of renovations.